This text provides an up-to-date description of the photovoltaic (PV) components and systems. It contains detailed information on several carefully planned experiments on solar PV cells and modules. The book is divided into two sections: User Manual and Experiments. The experiments are related to the characterization and simulation of solar cells to allow the users to measure various kinds of data on solar cells, modules and PV systems. The simulation experiments would enable the users to simulate solar cells and circuits containing solar cells. The Manual provides an intuitive grasp of PV system components and their behaviour in the field through a discussion of the underlying objectives, expected outcome, theory, equipment used, measurement methodology and results. 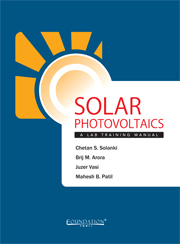 The Manual will help users in understanding and execution of various experiments related to solar PV. This book would be an extremely useful reference manual not only for the technicians and system installers working in the PV field, but also for the students and researchers interested in understanding the fundamental aspects of PV system components and their interconnection.